The VOOPOO Drag Mini TC Kit is right here! It consists of a Drag Mini MOD and a Voopoo UFORCE T2 tank. Powered by inbuilt 4400mAh battery, the Drag Mini supports a powerful output of 117W. As a new generation of drag, the VOOPOO Drag Mini is more reliable than you have ever imagined. The Drag Mini MOD adopts GENE.FIT chip. The innovative FIT mode brings both security and convenience to vapers. FIT is a mode that can protect tanks to the most with its intelligent matches of FIT 1/2/3. The VOOPOO UFORCE T2 Tank is an innovative subohm tank empowered with strong clouds and an optimal flavor. The UFORCE T2 can also prevent the e-juice leakage by pushing the top cap. 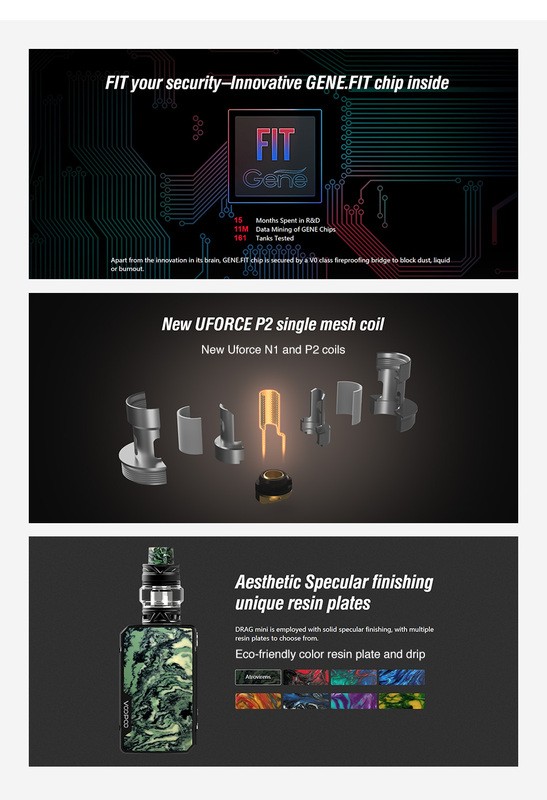 Looking for coils for the Voopoo UFORCE T2 from the Voopoo Drag Mini Kit? Click here.